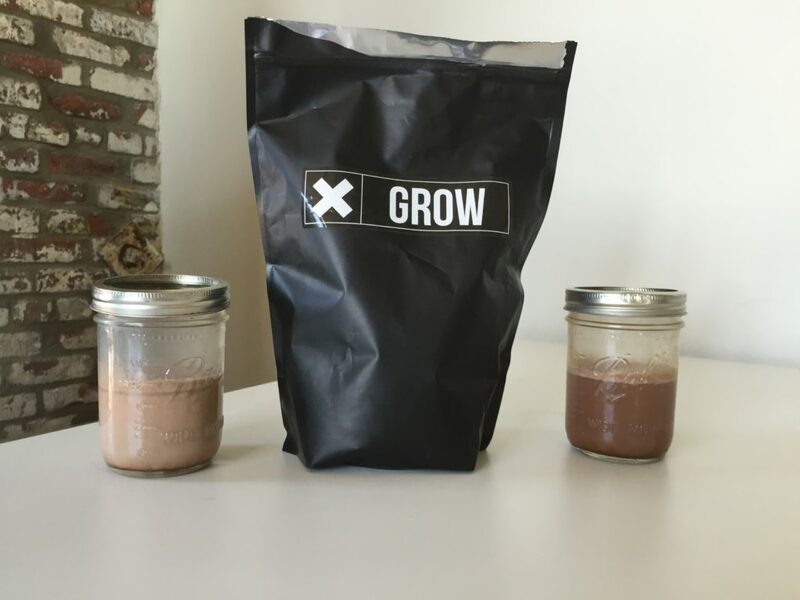 Home » Xwerks Grow Whey Protein Review — Is Grassfed Better? 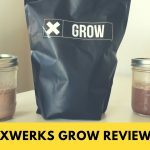 Xwerks Grow Whey Protein Review — Is Grassfed Better? Xwerks is a Florida-based supplement company that has a particularly dedicated following among the functional fitness crowd. 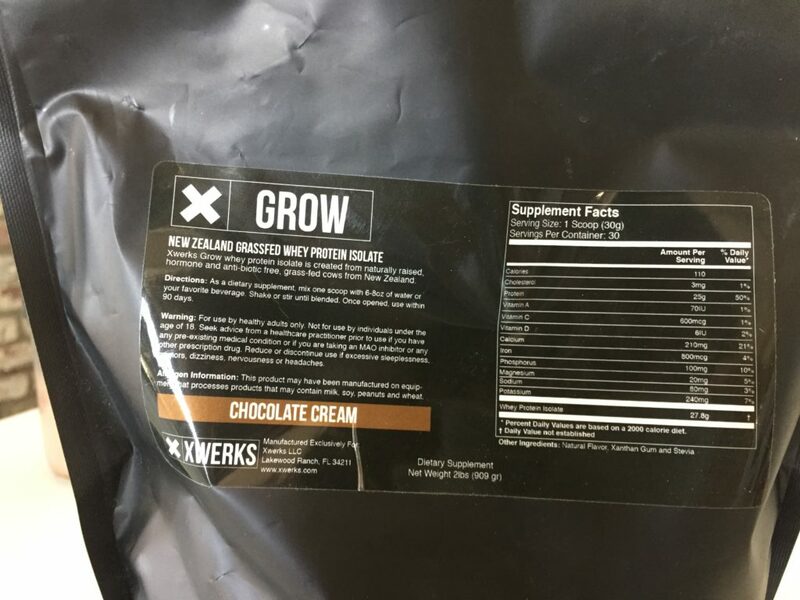 The brand sponsors a few big name CrossFit® Games athletes, most notably Noah Olsen, and their slogan is “Optimizing Human Performance.” Today I’m review Xwerks Grow protein powder. They don’t sell a ton of supplements: they have one preworkout, one creatine, one fish oil, and one protein powder. That’s what I tried today: Xwerks’ “New Zealand Grassfed Whey Protein Isolate.” Let’s see what it’s like. One scoop contains 110 calories and 25 grams of protein. What’s really surprising is that the nutrition label doesn’t include the amount of carbohydrates or fat. Xwerks informed me that this is because the product doesn’t have any carbs or fat, but that should have been put on the label. As far as micronutrients go, one scoop contains a pretty impressive 21 percent of your recommended daily intake of calcium, as well as just three percent of your daily sodium intake (80mg). For a whey powder, that’s both high calcium and low sodium — a relatively rare occurrence. One of the very few protein powders with no carbs or fat whatsoever. The ingredients list is unusual, and I can see why it would appeal to the functional fitness crowd: there’s nothing but whey protein isolate, natural flavor, xanthan gum, and stevia. Every ingredient is natural. Well, the term “natural” might be debatable when you’re talking xanthan gum, a thickener and stabilizer, but it’s made by mixing fermented sugar with bacteria and is considered safe in small doses. Some have found side effects like gas and bloating in dosages of fifteen grams or more, but there’s probably less than a gram of the stuff in a scoop of this product. 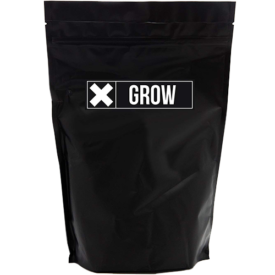 Grow only comes in 2-pound bags which cost 49 dollars a piece. With thirty servings per bag, you’re looking at $1.63 per serving or 6.53 cents per gram of protein. That’s expensive. Compare that with other whey isolates on the market like Optimum Nutrition’s Whey Isolate (4.48 cents per gram, 5-pound tub), AllMax IsoFlex (4.34 cents per gram of protein, 5-pound tub), Dymatize Iso 100 (4.22 cents per gram of protein, 5-pound tub), Isopure Low Carb (3.86 cents per gram, 3-pound tub), and BPI Sports’ Iso HD (3.48 cents per gram). That said, Xwerks does provide free shipping for their product, which might make the cost more worthwhile if you do your supplement shopping online. So, this product is on the pricier side, but there are a few things I should emphasize. First, the whey is grassfed. That doesn’t actually confer any nutritional benefits — the benefits of grassfed dairy is in the fat content, and there’s no fat in this product — but the cows are free range, which is nice to know, and according to the Xwerks website they’re not treated with any hormones, antibiotics, or pesticides. The whey is also imported from New Zealand, which will raise the cost a little. Also, this product goes out of its way to ensure it’s free of artificial flavors and sweeteners. It’s sweetened with stevia, made from the stevia leaf, and of course it’s pricier than your artificial sweeteners. Finally, this is a protein isolate that’s cold-filtered, which is a little bit pricier. The idea is that cold-filtered whey helps to make sure the protein isn’t denatured. The science is split as to whether or not this is a big deal — we appear to absorb denatured protein just fine, if not better — but the filtration process means that this product is technically raw dairy. Does it matter if your whey is raw? Well, there might be higher amounts of certain substances like alpha lactalbumin and immunoglobulins, ingredients that are good for the baby cows that drink milk — they’re linked to brain growth and immune strength. They probably don’t make a huge difference when you’re talking about a scoop of whey but a lot of people, particularly Paleo folks, like all their dairy to be raw so this will have some extra appeal to them. I should also point out that this is a whey isolate, meaning it’s very low in calories, carbs, and fat. Bodybuilders often covet isolate because it also digests quite quickly — this won’t make a big difference for the vast majority of consumers, but it does make for a shake that’s easy to consume on an empty stomach before a workout. Xwerks Grow is free from lactose, soy, gluten, and artificial sweeteners, flavors, and coloring. A lot of whey protein powders are low in some or most of these, but very, very few tick as many boxes as Xwerks Grow. Note that while it’s free from a lot of allergens, it doesn’t come with any digestive enzymes, so if you have trouble digesting powdered protein this might not be the best pick. The unfortunate side effect of a whey that’s free of lecithin or any other products designed to artificially improve mixability is that — no surprise — the mixability isn’t great. It’s not terrible, but there’s no shortage of granules in a shaker cup and it settles quite quickly after mixing. I tried the chocolate flavor, and it tastes fantastic with milk. I’ve had a lot of protein powders that try to taste good in both milk and water, with the end result being a product that’s often too sweet for milk. Xwerks is great with milk (you can tell it’s sweetened naturally) but alas, it’s bland with water. That’s to be expected in a product without anything artificial to give it a creamy, milky taste in water. It’s tough to make a protein powder that pleases everyone. If it’s all-natural, it won’t mix well and probably won’t taste great with water. If it mixes great with anything, the cons will focus on the artificial ingredients. What matters here is what you, the individual, prioritize in your protein. If you’re not concerned with whether or not a protein powder is “all natural” and are primarily concerned with drinking something that tastes great, mixes well, and isn’t too expensive, you won’t be thrilled by Xwerks Grow. But if you avoid artificial ingredients, if you’re Paleo (plus whey), if you prefer dairy from free range and hormone-free cows, or if you just don’t mind paying extra for higher quality, Xwerks Grow could be a good choice. It’s a premium product — just remember that the price reflects that.